As mentioned in previous posts, the Taskforce offered a range of workshops during its sector forums in Newcastle, London, Bristol and Birmingham. In the latter 3 venues, not all the people at the event could attend all the sessions, so the Taskforce is using this series of blog posts to enable everyone to see the presentations and get a flavour of the discussions that took place. The workshop on Mutuals and other alternative delivery models was held 11 times. Sessions were held in all the locations and were attended by around 120 people. I led sessions in Newcastle, London and Bristol, and my colleague Celia Mortimer ran the ones held in Birmingham. We supplemented our presentation and discussion with these slides. We clarified what we mean by a ‘public sector mutual’ (or PSM). It’s an organisation that was or had been in the public sector, which continues to run public services, and which has a significant degree of employee control, influence or ownership. As such, it could have a wide range of legal forms - for example, a trust or a community interest company. We also shared some of the early findings from research we’ve been doing into how sustainable mutuals have been proving to be, and important lessons about what makes them successful. We’ll be publishing this research in the next week or two. The government is due to publish a broader strategy encouraging public sector mutuals shortly - and this delivery model was one which had been highlighted in the Libraries Deliver: Ambition document. Rob Wilson, the Libraries Minister, has said that there are a range of practical and innovative options that library authorities can consider in seeking to maintain and transform frontline library services, including the potential to consider other governance models such as public service mutuals. We want to provide advice and support to those looking for more effective ways to run their library service. In turn, the Minister has said that he expects to see library authorities working with their local communities and with government to properly consider a full range of options, and seek to ensure library services are sustainable for the long term, before making significant changes to their library services. However, we hope we made it clear during our sessions that a PSM would not necessarily be right for all situations, and that any library authority should first undertake a full options appraisal to see how it compares to other routes they could look at. We also made it clear that delivering library services through a PSM or other delivery model doesn’t remove the library authority’s statutory duty to provide a comprehensive and efficient library service. It means that the council would be meeting their duty by commissioning another organisation to achieve the necessary outcomes on their behalf. 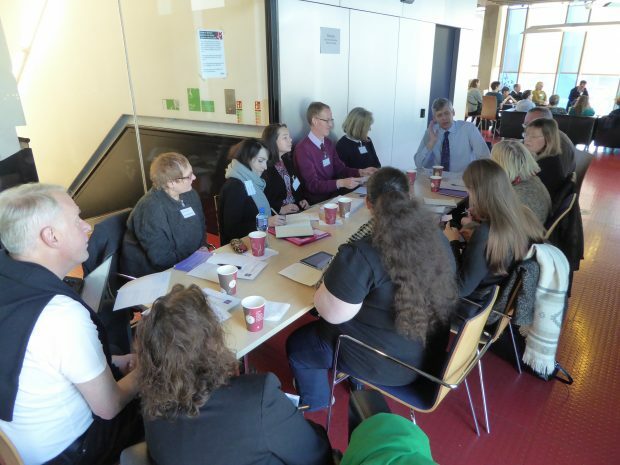 The 4 existing library mutuals (Suffolk Libraries, Libraries Unlimited in Devon, Explore York and Inspire in Nottinghamshire) were discussed; representatives from those organisations were present at a number of the sessions and helped answer questions by sharing their learning and experience. And we also drew off the wider learning we’ve gained from our recent research into existing mutuals across all sectors. We emphasised that mutualising tended to be a fairly lengthy process, which was very demanding on all sides; but that the library services (and organisations from other sectors) that had gone through it generally felt very positive about the outcomes and the experience of having spun out. Where new organisations had achieved charitable status, there was also the opportunity to unlock new sources of grants and funding which weren’t open to in-house council services. We’ve learnt that senior stakeholders need to be fully bought in to make mutualisation run smoothly. Drivers to explore this route varied - in some cases, the impetus had come from within the service, and in others from the council. Some councils have seen mutualisation as a way to minimise the risk they need to manage in running a service (although others have said the opposite - that they’re concerned that delivering via a mutual could be more risky!). One of the things that hasn’t been an adverse feature of this model is party politics - to date, mutualisation has proved to be acceptable across all political persuasions. However, once underway, an organisation developing plans to mutualise needs to ensure that it gets the right skills mix involved, both at set-up and then moving forward into operation. We especially highlighted feedback we’ve received on the advantages of getting independent legal and financial advice from the off. This is both to avoid any potential future conflicts of interest during spin out negotiations, and also because of the different financial and legal frameworks that a non-council organisation will need to gear up to work within. The importance of identifying a strong board of trustees has also been frequently mentioned, as has the need for high quality leadership at all levels. There were discussions at all the sessions about different types of support that would be valuable; some technical input and expertise would certainly need to be bought in, but peer support - learning from the experiences of others who had already gone down this route - was also seen as valuable. Libraries Deliver: Ambition said that DCMS would be providing some dedicated support for libraries considering exploring alternative delivery models this financial year. One of the ways it is doing this is commissioning Optimo (a consortium formed of the existing libraries mutuals, plus input from Mutual Ventures, technical experts in this field) to run 2 free masterclasses, (on 24 March in London and 28 March in York). These events will offer dedicated support for councils to think strategically about alternative delivery model options for their libraries. They are designed to bring together different perspectives - from heads of library services, elected members, transformation officers and other interested parties. To get the best out of these sessions, we recommend that councils identify a group of relevant people to attend. What lessons can we learn from library services that have already established as alternative delivery models? DCMS and the Libraries Taskforce has also commissioned Optimo to draw together a toolkit to help library services considering alternative delivery models get through all the different stages of work needed, with practical resources and case studies to help guide their thinking. This will be published in late March, so watch this space! And we expect to make more support available next financial year as well. If you have any views to share on this topic, or are interested in getting advice on whether this might be a route you want to explore, then please either email us or leave a comment below; and look out for a further guest blog from Fiona Williams, Chief Executive at YorkExplore, telling you more about the Masterclasses.